As winter approaches we would like to share these winter time tips from AVMA. Keeping your pets safe and comfortable during the long winter is of great importance to us all! Winter wellness: Has your pet had his/her preventive care exam (wellness exam) yet? Cold weather may worsen some medical conditions such as arthritis. Your pet should be examined by a veterinarian at least once a year, and it's as good a time as any to get him/her checked out to make sure (s)he is ready and as healthy as possible for cold weather. Know the limits: Just like people, pets' cold tolerance can vary from pet to pet based on their coat, body fat stores, activity level, and health. Be aware of your pet's tolerance for cold weather, and adjust accordingly. You will probably need to shorten your dog's walks in very cold weather to protect you both from weather-associated health risks. Arthritic and elderly pets may have more difficulty walking on snow and ice and may be more prone to slipping and falling. Long-haired or thick-coated dogs tend to be more cold-tolerant, but are still at risk in cold weather. Short-haired pets feel the cold faster because they have less protection, and short-legged pets may become cold faster because their bellies and bodies are more likely to come into contact with snow-covered ground. Pets with diabetes, heart disease, kidney disease, or hormonal imbalances (such as Cushing's disease) may have a harder time regulating their body temperature, and may be more susceptible to problems from temperature extremes. The same goes for very young and very old pets. If you need help determining your pet's temperature limits, consult your veterinarian. Stay inside. Cats and dogs should be kept inside during cold weather. It's a common belief that dogs and cats are resistant than people to cold weather because of their fur, but it's untrue. Like people, cats and dogs are susceptible to frostbite and hypothermia and should be kept inside. Longer-haired and thick-coated dog breeds, such as huskies and other dogs bred for colder climates, are more tolerant of cold weather; but no pet should be left outside for long periods of time in below-freezing weather. Make some noise: A warm vehicle engine can be an appealing heat source for outdoor and feral cats, but it's deadly. Check underneath your car, bang on the hood, and honk the horn before starting the engine to encourage feline hitchhikers to abandon their roost under the hood. Check the paws: Check your dog's paws frequently for signs of cold-weather injury or damage, such as cracked paw pads or bleeding. During a walk, a sudden lameness may be due to an injury or may be due to ice accumulation between his/her toes. You may be able to reduce the chance of iceball accumulation by clipping the hair between your dog's toes. Play dress-up: If your dog has a short coat or seems bothered by the cold weather, consider a sweater or dog coat. Have several on hand, so you can use a dry sweater or coat each time your dog goes outside. Wet sweaters or coats can actually make your dog colder. 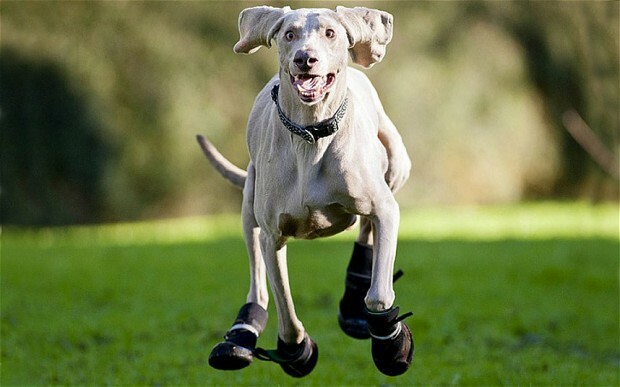 Some pet owners also use booties to protect their dog's feet; if you choose to use them, make sure they fit properly. Wipe down: During walks, your dog's feet, legs and belly may pick up deicers, antifreeze, or other chemicals that could be toxic. When you get back inside, wipe down (or wash) your pet's feet, legs and belly to remove these chemicals and reduce the risk that your dog will be poisoned after (s)he licks them off of his/her feet or fur. Consider using pet-safe deicers on your property to protect your pets and the others in your neighborhood. Collar and chip: Many pets become lost in winter because snow and ice can hide recognizable scents that might normally help your pet find his/her way back home. Make sure your pet has a well-fitting collar with up-to-date identification and contact information. A microchip is a more permanent means of identification, but it's critical that you keep the registration up to date. Stay home: Hot cars are a known threat to pets, but cold cars also pose significant risk to your pet's health. You're already familiar with how a car can rapidly cool down in cold weather; it becomes like a refrigerator, and can rapidly chill your pet. Pets that are young, old, ill, or thin are particularly susceptible to cold environments and should never be left in cold cars. Limit car travel to only that which is necessary, and don't leave your pet unattended in the vehicle. Prevent poisoning: Clean up any antifreeze spills quickly, as even small amounts of antifreeze can be deadly. Make sure your pets don't have access to medication bottles, household chemicals, potentially toxic foods such as onions, xylitol (a sugar substitute) and chocolate. Protect family: Odds are your pet will be spending more time inside during the winter, so it's a good time to make sure your house is properly pet-proofed. Use space heaters with caution around pets, because they can burn or they can be knocked over, potentially starting a fire. Check your furnace before the cold weather sets in to make sure it's working efficiently, and install carbon monoxide detectors to keep your entire family safe from harm. If you have a pet bird, make sure its cage is away from drafts. Avoid ice: When walking your dog, stay away from frozen ponds, lakes and other water. You don't know if the ice will support your dog's weight, and if your dog breaks through the ice it could be deadly. And if this happens and you instinctively try to save your dog, both of your lives could be in jeopardy. Provide shelter: We don't recommend keeping any pet outside for long periods of time, but if you are unable to keep your dog inside during cold weather, provide him/her with a warm, solid shelter against wind. Make sure that they have unlimited access to fresh, non-frozen water (by changing the water frequently or using a pet-safe, heated water bowl). The floor of the shelter should be off of the ground (to minimize heat loss into the ground) and the bedding should be thick, dry and changed regularly to provide a warm, dry environment. The door to the shelter should be positioned away from prevailing winds. Space heaters and heat lamps should be avoided because of the risk of burns or fire. Heated pet mats should also be used with caution because they are still capable of causing burns. Feed well: Keep your pet at a healthy weight throughout the winter. Some pet owners feel that a little extra weight gives their pet some extra protection from cold, but the health risks associated with that extra weight don't make it worth doing. Watch your pet's body condition and keep them in the healthy range. Outdoor pets will require more calories in the winter to generate enough body heat and energy to keep them warm – talk to your veterinarian about your pet's nutritional needs during cold weather. Spring is here and so is the time to get outside and enjoy our beautiful weather! When you go out and enjoy the outdoors with your pet or companions, it is important to carry first aid items in the event of an emergency. Each outing may require different materials so pack accordingly. Although you probably already bring a human first aid kit with you and many of the same materials are compatible, here is our list of recommendations for your dog. Please feel free to modify as needed! minutes to absorb – try not to let your pet lick this off. WARNING: do not use in eyes or mouth. three times a day (every 8 hours). Okay to use with Benadryl oral tablets also. Use: Temporary relief of itching. WARNING: Do not use in eyes or mouth. Do not apply directly onto wounds as this cream can interfere with healing. Dose: 1ml per pound or 1 tsp per 5 pounds or 1 Tbsp per 15 pounds. Use: To induce vomiting within 2 to 4 hours of ingestion of something poisonous, toxic, or a foreign body (such as rocks, socks). Once signs of intoxication are present, inducing vomiting is of little to no use. A maximum of two doses can be used to induce vomiting. If the first dose does not work within 10 to 15 minutes, a second dose (of the same volume) can be administered. If two doses have been given, and the substance has not been vomited or vomiting has not occurred, DO NOT GIVE additional doses. WARNING: Inducing vomiting may lead to aspiration pneumonia. Do not induce vomiting if the dog is lethargic, mentally altered or comatose. Do not use if dog ingested corrosive substances, sharp or large objects. Do NOT use in cats. NOTE: Vomiting does not completely empty the stomach. If a high enough dose was ingested even after inducing vomiting, toxicity is still possible. To learn more about what is toxic to your dog and cat, check out petpoisonhelpline.com. If your pet ingested something toxic, call the Pet Poison Helpline at 855-764-7661 (a $49 charge does apply to speak with a veterinary toxicologist) OR 907-376-7930 to speak with us if we are available. Even if your pet is not due for medications while you are out hiking, be sure to take a small quantity with you just in case something should happen and you won’t make it back home in time for the next dose. If you are traveling remotely, be sure to have extra with you just in case you can’t make it back in time for refills. Use: for patients that are weak or lethargic and possibly hypoglycemic (low blood sugar) (very important to carry for diabetic patients). Apply a small amount to the gums of your pet if concerned – there is no harm with this. WARNING: Ideally, do not use your fingers (as you will absorb some of the sugar) and apply with a syringe, spoon, other object to the gums. Diluting instructions: 1 part Betadine to 10 parts sterile saline for disinfection. 1 part betadine to 100 parts sterile saline for flushing. NOTE: In the field, fresh water is an OK substitute for saline. WARNING: Do not use in or around eyes or in the mouth. Use: This is used to stop tiny bleeds such as with a broken toenail or small ear wound. Will not stop large bleeds and may burn when applied. WARNING: always monitor the bandaged area for swelling around the bandaging. Applying a bandage too tightly can cause pressure necrosis (death of tissue). If swelling is noted from the bandage, loosen the bandage, remove or replace bandage lightly. Note: Oozing bandages should be changed as frequently as every few hours or when strike through (blood or discharge) is seen on the outside of the bandage. Bandages covering small wounds can be changed every 24 hours. If the bandage is on the foot, leave a small opening for the toes and monitor the toes s for swelling and coldness. If the toes are swollen or cold, the bandage is too tight and should be removed. Also be sure to keep the bandage clean and dry. Wet bandages promote infection and dirt. Take a Ziploc bag with you in your first aid kit and use this to place over the bandage if needed to place this on the paws. Use: to help clean wounds, dry your pet off, keep your pet warm, and lay supplies on. Use: grooming and removal of debris (twigs, splinters, thorns, etc) from coat, skin and/or wounds. Spring! What a Wonderful time in Alaska unless your pet has allergies! 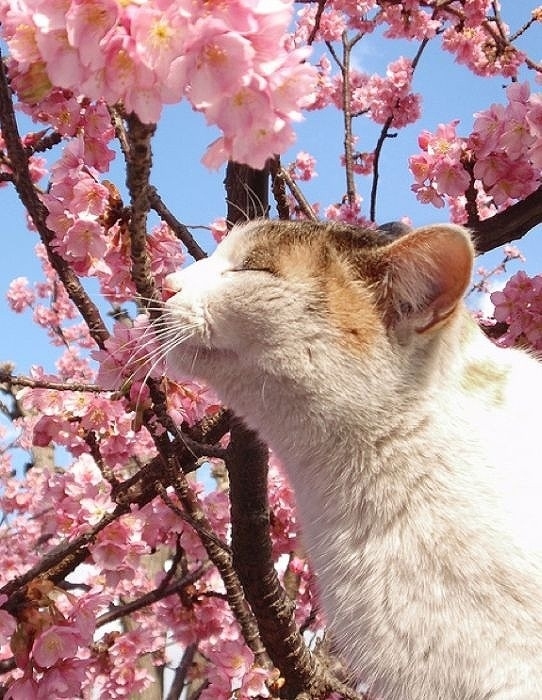 Just like humans, the emergence of plant life in the spring and summer can trigger the allergies in your pet to flare up. Although the airborne allergens don’t limit themselves to the spring and summer, this is the season that things are worst. Unlike humans though who are known for itchy eyes and sneezing, most often the symptoms our dogs show are related to skin inflammation- dog’s scratching and chewing at themselves, skin infections and ear infections. When the allergy is due to things that are airborne, this is called “atopy”. While we can't avoid pollen and allergens entirely we can cope with them using a lot of different tools. Other types of allergies are food allergies, contact allergies and insect bite allergies- while some of the treatments are the same, we’ll cover atopy in this blog. Atopy is considered a heritable trait. It is found in dogs and cats of all breeds however the incidence is higher in certain breeds. The most well known breeds include Boxers, West highland White Terriers along with other terriers, Golden Retrievers, Labrador Retrievers, Pugs and many more. When Does Atopy Show Up? Most dogs- about 70%- who are going to have seasonal allergies start up with symptoms sometime between ages 1-3 years however they can develop later in life as well. 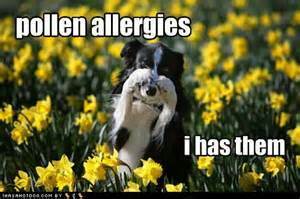 Spring and summer are the most common seasons to see these allergies however some animals show signs year round. Over the years the portion of the year that an individual has trouble with tends to increase so that some pets end up having symptoms year round. How do I know if my pet has atopy? 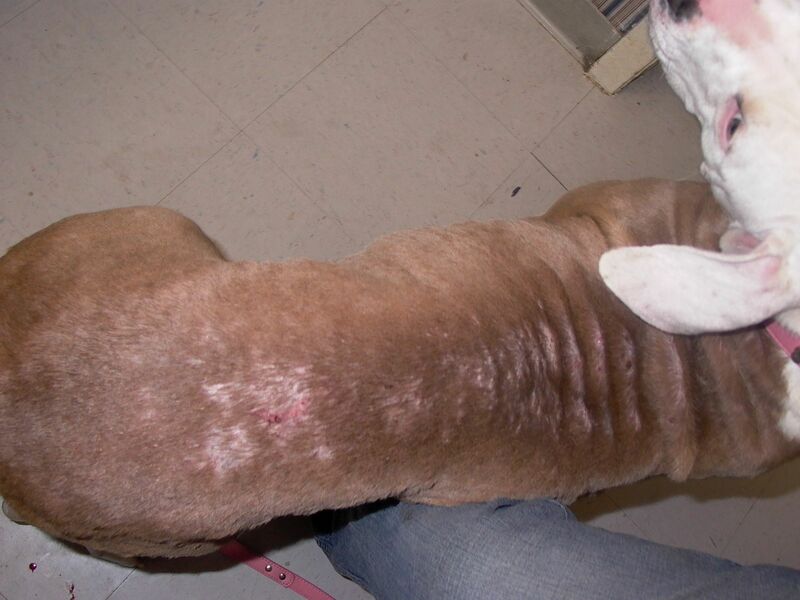 Our veterinarians will take samples to rule out concurrent skin infections. 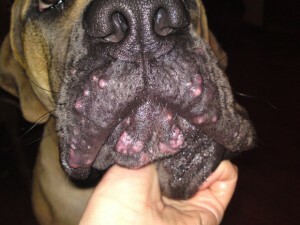 Many dogs and cats with allergies have had inflamed skin for so long that the normal skin defenses that protect against infections are unable to keep bacteria and yeast at bay. 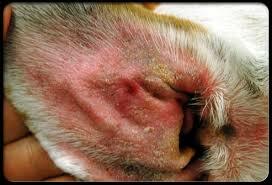 These infections can cause the pet to itch as well and need to be treated. 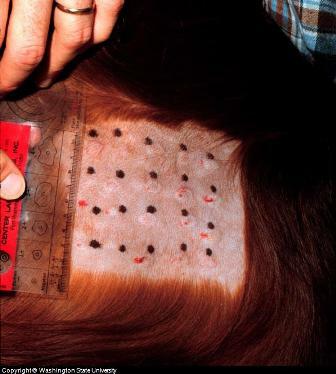 Intradermal allergy testing: This is sometimes performed to determine which allergens a pet reacts to and is considered the most accurate allergy testing method. These are performed by shaving an area to expose the skin and a series of small injections containing small amounts of allergy causing substances. These are done in rows and the size of the bump that forms helps tell if the body is having an excessive reaction to each substance. With this information we can tell which pollens the pet is hypersensitive to. The main intent of finding out what your pet is reacting to is to be able to develop injections to try to desensitize the pet to those particular things. Antibody testing for allergies: This is a blood test that measures the levels of certain antibodies to pollens, fungi and other allergens. By knowing that a pet has really high levels of the special kind of antibodies linked with allergies, we can be suspicious the pet is allergic to that substance. These results need to be analyzed by the veterinarian carefully though, as having high antibodies doesn’t always mean allergy. Steroid response: Allergies tend to respond very well to the medications called steroids. The most well known of these is prednisone. 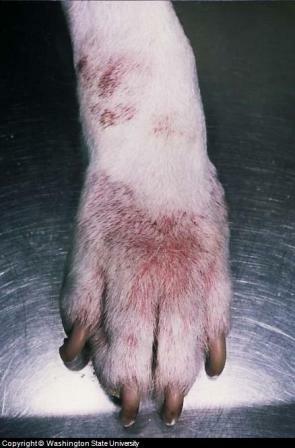 Unfortunately, many other causes of itching can also respond to steroids so this is not conclusive, but is merely suggestive that a pet has allergies. Diet trial: While this is to detect dietary allergies, a diet trial is sometimes performed even when atopy is suspected to try to see if foods are playing a role as well. Many pets have both atopy and food allergies. Try to keep them indoors as much as possible during the worse seasons and monitor the pollen reports if you know what your pet reacts to. 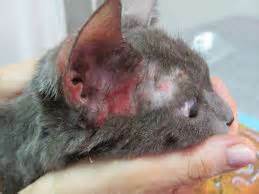 When outdoors, try to keep them off grass and other plants as these can get through the fur to the skin. While we used to believe that allergens like pollen gained entrance to the body primarily through the respiratory tract, we now know that a large amount are directly absorbed into the skin’s surface. 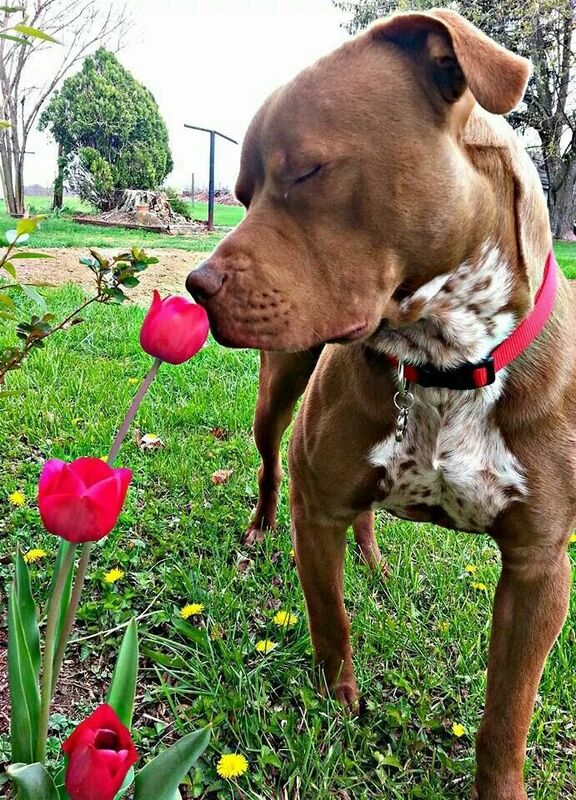 Keeping a pet off high allergen surfaces like your lawn grass may reduce the amount of pollen on his skin. 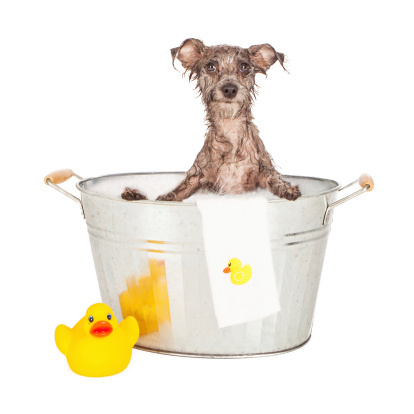 If you can, it is also good to give your pet a rinse off in clean water if they've been outside on a high pollen day. For some animals who particularly have problems with their feet, just rinsing the paws can help. You can also place booties on your pet's feet - just be sure that these booties fit appropriately and are not too tight to cut off circulation. Not one bootie exists for all pets! Many pets can benefit from medicated shampoos and coat conditioners to control itching or infections that may be prescribed by one of our veterinarians. It’s important to keep in mind that the instructions for these often include leaving the lather on the dog or cat for a certain amount of time. This is very important to get the best effect. There are many medications that help to suppress the itching of allergies. Antihistamines- veterinary dermatologists see about 10-20% of dogs respond to a given antihistamine.There are several that can be used though and trying a few before deciding what works for your pet is often worthwhile.These are often very safe, inexpensive medications but they may not work for every dog. Also, they are unlikely to be 100% effective alone, and are often more effective when used with other treatments. Cats often respond better than dogs but oral medications are often difficult for an owner to give to a cat long term. Steroids- as mentioned above, these are fantastic at suppressing the itching but are often only used for short term control since they have several clinical negative side effects when used for a long time.They are sometimes the best thing though to “douse the fire” when a pet is severely flared up. Cyclosporine- This is an immune system suppressant. After all, allergies are a version of the immune system being hyper-reactive to something.This medication can work well with fewer side effects than the steroids but can take some time to work and, for the moment, can be costly- especially for large dogs. Apoquel- This is a drug that acts on some of the chemical mediators of itching in the body. It’s relatively new but has been working very well for some patients.There has been such a high demand when it was first released that the company has had difficulty having enough product to fill orders; they promise to have more by May 2015. Omega 3 Fatty Acids- these are the fats found in flax and fish oils. 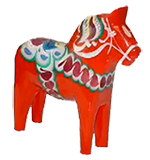 There are two primary ones- EPA and DHA. 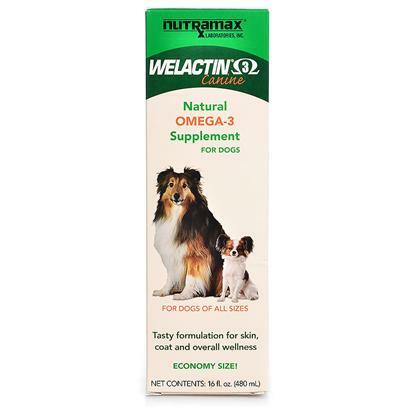 We recommend Welactin. 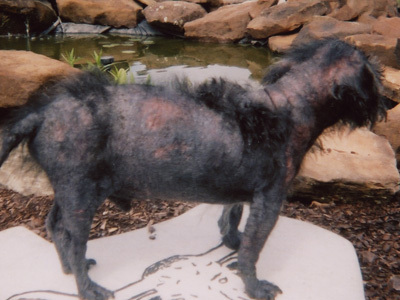 This treatment can occur after allergy testing has been done to determine what exact things are affecting the pet. Extracts are made of the very things that your pet shows sensitivity to and these are given by injection under the skin. The injections start out with very small doses but given quite frequently and build up to higher doses eventually given approximately once monthly. If this works for your pet, it tends to be a great option with few side effects. Unfortunately, this attempt to retrain the immune system to ignore the allergens doesn’t work all the time. Approximately 25-30% of pets do not respond to the treatment, and about another 25-30% will still need some other treatments beyond the injections to keep them comfortable. Hyposensitization therapy will take 6-12 months to take effect so often pets will need some management in the meanwhile to keep things under control until then. As you can see, allergies are a complex issue for pets and range in severity from a minor annoyance to a terrible discomfort. We would love to have the chance to discuss this with you if you feel your pet may have allergies and help make him or her enjoy a more comfortable life! Does My Pet Need a Dental? What’s Involved in Dental Cleanings? Up to 85% of dogs and cats over the age of 6 have dental disease. Dental disease is very common, but not “normal” in pets! 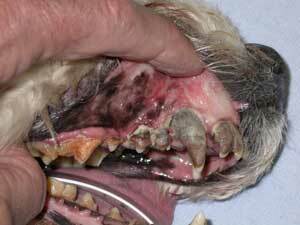 Dental tartar is a source of infection in animals and will progress to painful tooth loss. - Loose teeth or teeth that are discolored or covered in tartar. - Your pet shies away from you when you touch the mouth area. - Drooling or dropping food from the mouth. Does your pet’s mouth look like any of these? If so, your pet could benefit from a dental! All of these pets have some degree of periodontal disease, and other than bad breath, most of them had no other signs visible to the owner. If your pet has any of these stages, they would benefit from a dental cleaning. 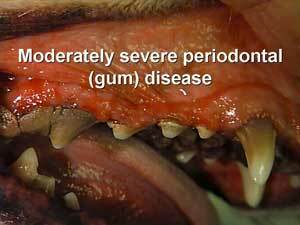 Even stage 1 periodontal disease can benefit! This is the stage where preventative action can take place rather than reactive cleanings (i.e. cleanings and prevention at home versus extracting multiple teeth). 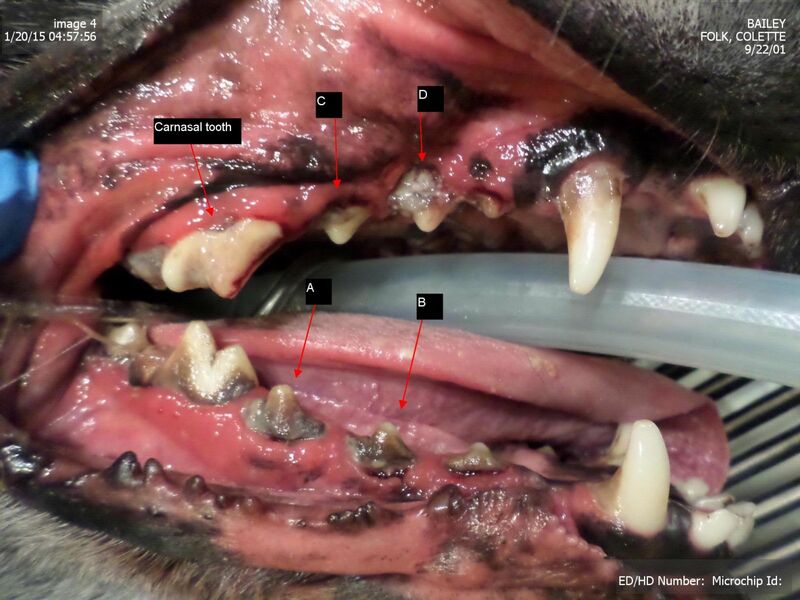 http://avdc.org/AFD/five-stages-of-pet-periodontal-disease/. This website is published by the American Veterinary Dental College who formulates our dental guidelines as well as providing excellent educational resources. Why does my pet have dental disease? The cause of dental disease is the same in cats and dogs as it is in people. Dental and gum disease are an infection resulting from build-up of soft dental plaque on the surfaces of the teeth around the gums. Hard dental tartar (calculus) consists of calcium salts from saliva deposited on plaque. Tartar starts to form within a few days on a tooth surface that is not kept clean, and provides a rough surface that enhances further plaque accumulation. The bacteria in dental plaque irritate the gum tissue if plaque is allowed to accumulate. The more irritated the gum tissue, the more plaque can develop under the gum-line often leading to infection in the bone surrounding the teeth. Once infection around the bone occurs, this damage is difficult to reverse. This causes pain and discomfort, and usually results in the loss of the tooth. 1)Cats and small breed dogs (toy breeds especially) have small heads and small mouths with relatively large teeth. This creates crowding and more surface area for the tartar to accumulate; thus resulting in dental disease. They are at a greater risk of having developmental and anatomical abnormalities with their mouth leading to serious dental issues. 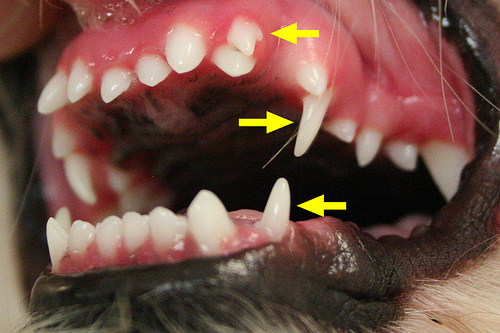 We want these "baby" teeth to fall out naturally, but they often do not in small breed puppies. If they have not fallen out naturally by 6 months of age, then we will manually remove them to help decrease tartar build-up and crowding in the mouth. What does a dental procedure involve? What are dental radiographs (x-rays) and are they necessary? Just like with our dentists, dental x-rays allow us to evaluate the tooth below the gum-line as well as evaluate the enamel of the teeth. A tooth may appear healthy on the surface but have diseased roots or pockets of infection beneath the gum-line that are causing pain. Common painful problems that could be identified with radiographs are broken teeth and roots, associated bone loss, periodontal disease, dead teeth, abscesses or infected teeth. This is a Labrador Retriever’s mouth. Can you tell which teeth are damaged and need to be removed? Neither can we! 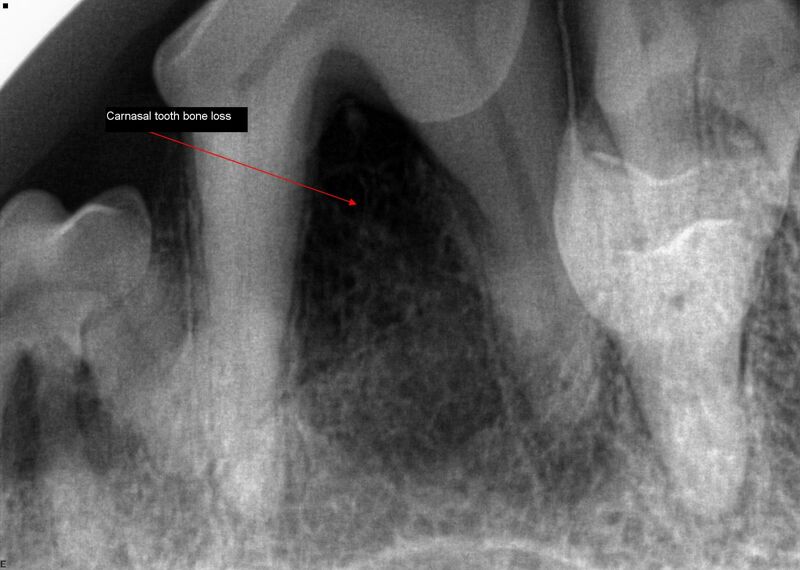 We can see what teeth are "gross-looking", but we cannot actually tell what roots are damaged below the gumline without radiographs. 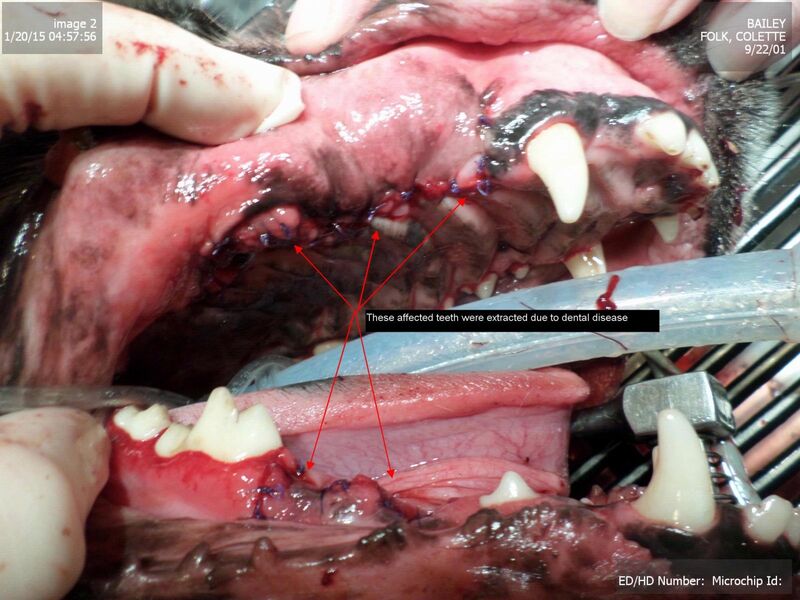 Here is the Labrador's mouth after identifiying multiple problems on xrays and resulting in multiple extractions. How will my pet eat if several teeth are extracted? This is a concern for many clients, however removing diseased teeth is actually better for your pet than leaving in damaged, infected teeth. No teeth is better than bad teeth! In many cases, once the diseased teeth are removed the pet actually eats better because the pain and infection are gone! My pet still eats fine and the teeth look bad…is he/she in pain? Animals have a strong natural instinct to hide pain. Normal eating is not a reliable indicator of pain! In many cases clients state a major change in pets’ behavior after dental disease is appropriately treated. Often changes that are interpreted as normal signs of aging, such as slowing down and seeming less playful, are actually due to pain! Why do you have to use anesthesia to clean my pet’s teeth? Have you ever tried to look in your pet’s mouth or brush your pet’s teeth for an extended period of time? We have and it is not easy on your pet or us! 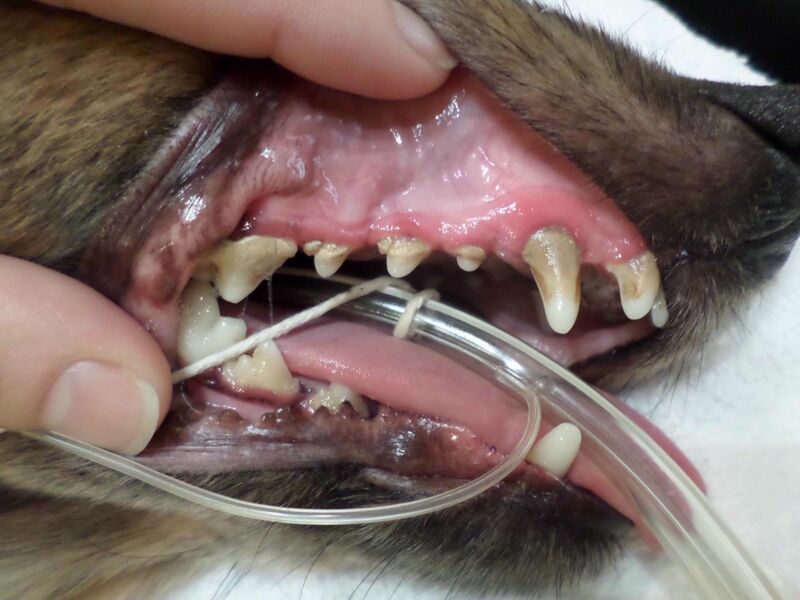 Anesthesia allows us to evaluate your pet’s mouth safely for everyone involved. Pets need to be under anesthesia so we can ultrasonically scale the inside and outside of the teeth as well as beneath the gum-line. Anesthesia provides three important functions: immobilization to allow us to clean below the gum line, pain control, and the ability to place a tube into the windpipe, so bacterial products do not enter the respiratory system. Anesthesia also allows us to evaluate for mobility in the teeth, take appropriate x-rays of the teeth, and if necessary, go ahead and extract a tooth all in one event. Anesthesia allows for a minimal amount of x-rays to be taken since the pet is not mobile and this decreases your pet’s exposure also. I am worried about anesthesia, is my pet too old for a dental procedure? I have heard about “anesthesia free” dentals, would this be a good option for my pet? Dental cleaning without anesthesia requires your pet to be restrained awake while the tartar is scraped from their teeth. This can be quite stressful and also dangerous – if a pet moves at the wrong time this could result in injury to themselves or the person performing the procedure. In addition, dental scraping without anesthesia does not allow for cleaning under the gum-line – where the real problem lies! Simply removing the tartar on the outside of the teeth may make them look good, but it does your pet no good and is a waste of your money! How much does a dental cost? We see many clients undergo “sticker shock” when we quote for dentals or an estimate is completed. Remember: When you have a cleaning performed, typically you have dental insurance to cover the majority of the costs causing the “sticker shock” for our mouths to be significantly less. When you compare the prices of human dentistry vs. veterinary dentistry without insurance, the costs for your pet are significantly less. Veterinary dentals are expensive (whether just a cleaning or a more invasive oral procedure) because your pet requires anesthesia to perform a thorough, complete, and proper dental cleaning. Do you remember how long you are typically at the dentist for to have xrays performed and a dental cleaning done? Usually 1-2 hours. Your pet’s dental cleaning often takes 1-2 hours also and this is often dependent on how many teeth need to be extracted. Extractions, especially of multi-rooted teeth, are often time-consuming. 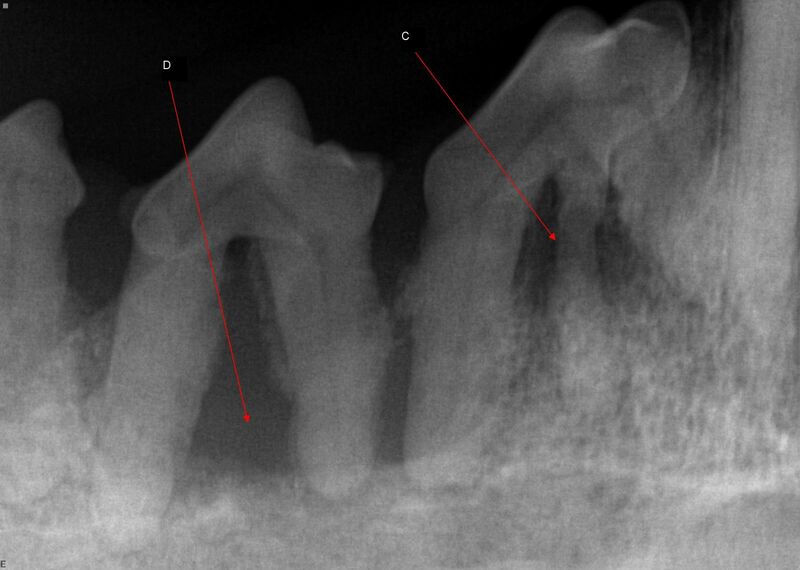 It is often hard to give an exact estimate because we don’t know what we are going to uncover once we clean the tartar off the teeth, take xrays, and probe the teeth for disease. We try to be as accurate as possible, but this is difficult due to the unknown. Our estimates include the examination, anesthesia, pain medication, antibiotics if necessary, xrays if necessary, and extractions if we think they are needed. If we weren’t expecting an extraction, we will often call you during the procedure to discuss this and let you know what the additional cost will be. It is important to try to prevent dental disease from developing in your pet. Brushing and at home prevention along with dental cleanings being performed when minimal tartar is present will prevent major oral surgery and major costs down the road. Unfortunately, many pets we see have severely diseased mouths that require more advanced, and costly, procedures. Feel free to discuss your pet’s dental condition with one of our veterinarians so we can develop a treatment and prevention plan to allow your pet to have a pain and infection free mouth! What about dental and tartar prevention? Stay tuned for our next blog posting for how to prevent tartar build-up for your pet. Thanks for reading and please feel free to contact us about any questions you may have! It’s time to update our feline vaccine protocols! Woo hoo! Just as with DA2PP in dogs, we are also extending our FDV vaccines in adult cats to every 3 years. Read more below for specifics. When does my cat start this protocol? After your cat has received an updated FDV vaccine for 2015, we will implement an every 3-year FDV protocol for him/her. Your cat has to be an adult, and had a proper kitten series for FDV and a yearly FDV booster at 1-1 ½ years of age for this protocol to be safe and effective. What does FDV do for my cat? FDV is commonly known as the feline distemper vaccine. The vaccine actually includes protection against feline panleukopenia, viral rhinotracheitis, and viral calicivirus. Panleukopenia is often fatal resulting in sepsis and very similar to canine parvovirus. Feline rhinotracheitis and calicivirus are upper respiratory virus’ that are not always fatal, but persistent and can create a lifetime of poor quality of life and medical needs. All 3 viruses are infectious and very contagious between cats! By vaccinating your cat, you are ensuring that your cat is protected against these viruses. Early protection and boostering this vaccine are key to decreasing your cat’s risk! What are the recommendations for kittens? For FDV, we recommend kittens be vaccinated at 8 weeks, 12 weeks, and 16 weeks. Kittens are at the highest susceptibility to the viral infections discussed above so we want to make sure we eliminate any chance of infection via multiple boosters. Why are so many kitten boosters needed? Kittens, just like puppies, have weak immune systems. Kittens also obtain protection from their mother through the consumption of “mother’s first milk” (colostrum). These antibodies, known as “maternal antibodies,” will help protect the kitten for the first few weeks of life. As the maternal antibodies start to dwindle, the kitten’s immune system begins to respond to infectious agents within its environment. Unfortunately, there is no diagnostic way to measure the levels, the effectiveness, or the duration of the maternal antibodies for the kittens. This means that the maternal antibodies may only last the kitten 8 weeks, or up to 16 weeks. This is why we recommend multiple boosters. Vaccination of kittens prior to 8 weeks of age may have no benefit due to adequate maternal antibodies from the mother. Unlike in dogs, we often worry more about poor maternal antibody protection as a large majority of our kitten population comes from stray cats that are typically unvaccinated. Certainly there is a degree of natural immunity that stray cats develop, but no scientific tests are available to measure this degree of protective immunity in the mothers or the kittens. What if my kitten is older than 8-12 weeks? Depending on your kitten’s age, we will develop an appropriate vaccine program to provide proper protection. If your kitten is older than 16 weeks of age for his/her first FDV vaccine, we will vaccinate at 16+ weeks of age, and then 3-4 weeks later. What comes after the kitten series? It is extremely important to booster your cat’s immunity 1 year after the last kitten vaccines. This occurs when your cat is 1-1 ½ years old. After this FDV booster, your cat will be started on an every 3-year FDV vaccine protocol. RABIES: Just like in dogs, Rabies is required by law for cats and follows the same protocol. Rabies must be given to your pet between 12 weeks and 6 months of age, and then administered a Rabies booster at 1-1 ½ years of age (for the same reasons as listed above for the FDV). After this booster, your pet will then be placed on a 3-year protocol. However, if your pet does not receive the 1-year booster during the appropriate time interval or goes beyond the 3 year interval, by law, we must start over with a 1 year protocol for your pet’s Rabies vaccine. Rabies is REQUIRED BY LAW. Unless your pet is sick or has extenuating circumstances, every pet must be vaccinated for Rabies at our clinic. Additionally, if you travel with your pet to the lower 48, your pet may be required to have Rabies administered yearly due to increased risk and exposure from raccoons, skunks, bats, etc. Feline Leukemia Virus Vaccine (FeLV): Feline leukemia is a fatal virus if contracted and is spread to other cats through any bodily fluid, including saliva, feces, milk and urine. FeLV transmission can also occur via sustained close contact through normal behaviors including mutual grooming, sharing of food/water bowls and litter boxes. 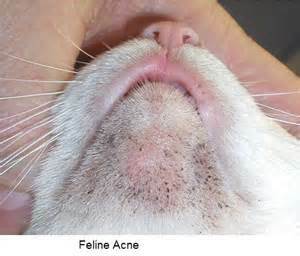 Fighting, mostly bite wounds, can contribute to the contraction of FeLV. As with other virus’, FeLV can affect a cat at any life stage. A FeLV vaccine does exist and has proven to be extremely effective. The American Association of Feline Practitioner’s (AAFP) now recommends ALL kittens be tested for FeLV and if negative for FeLV, be vaccinated for this virus as a kitten. The AAFP is a well-known, respected feline veterinary organization that has researched and produced the recommendations for vaccines in cats. Why does my normal kitten need to be tested for FeLV? Unfortunately, FeLV can be transmitted in-utero through an infected pregnant queen. This results in kittens born with FeLV; these kittens may be normal for many weeks and if survive, will have progressive infections as an adult. FeLV can also be transmitted via the milk or via the saliva as the mother’s groom their kittens. Vaccinating for FeLV is ineffective in cats positive for FeLV. We also want to know if your kitten has FeLV to advise you properly on what is to come, risks to other cats, and that it is extremely important to keep the infected cat isolated. We WILL NOT vaccinate your kitten for FeLV without a NEGATIVE FeLV test documented in the past month and no signs of recent exposure. What if I plan on my kitten staying indoor only? You never know when your “indoor only” cat may slip outside and become exposed; or your cat pesters you until you let them outside. Your cat may escape while traveling and encounter an infected individual. Are you sure this is your only cat? What if you want to get another cat – adult or kitten? There are so many unknowns – what if your cat is infected? What if the new cat is infected? If we vaccinate all kittens against FeLV, we could virtually eliminate this virus as a risk to your future cats. Knowing your cat is protected provides a piece of mind and helps to ensure the safety of all cats, whether indoor or outdoor. What is the protocol for FeLV vaccines? Whether your cat is a kitten or an adult, the initial FeLV vaccine is a series of 2 boosters. If you have a kitten, this will occur at 12 weeks and then at 15-16 weeks. The FeLV vaccine is then boostered at 1- 1 1/2 years of age. If you have an adult cat that you want to protect, your adult cat must first test FeLV negative. Then, it will be an initial FeLV vaccine, and a booster 3-4 weeks later. Unlike the FDV vaccine, FeLV vaccines are administered more frequently than every 3 years. This is because of a higher risk of interaction with the virus and the immunity provided by the vaccine has not been proven to last 3 years. For high risk individuals (those cats that are outdoors often and interact with other cats), it is recommended to booster FeLV vaccine annually. For low risk cats (indoor only), the AAFP recommends boostering the FeLV vaccine every 2 years. Does your cat still need an annual exam even though he/she may not be due for vaccines? ABSOLUTELY! Annual exams are the most important service we provide. Cats are amazing hiders of disease. Annual exams allow us to obtain baselines, discuss weight, hair coat, dental disease, and other issues that may arise. We all understand how difficult it may be to bring your cat to us. We just can’t express enough how important an annual exam for your cat is. Stay tuned for tips on how to make this easier for your and your cat. A recent study done by Zoetis Pharmaceuticals evaluated 563 dogs and cats for a standard wellness exam. 90 days later, all 563 dogs and cats were re-evaluated. Findings showed that 28% of those cats had new health risks in just 3 months! 36% of dogs had new health risks uncovered (article and statistics courtesy of Zoetis and dvm360.com). Additionally, annual examinations are also necessary for animals with chronic conditions, especially if they are on medications. In order for your veterinarian to legally dispense any prescription medications (ex. antibiotics, anti-seizure medication, anti-inflammatories, thyroid medication, etc) the V-C-P relationship must be maintained. This is maintained via an annual exam of your pet. 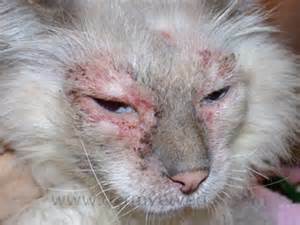 For more information about vaccinating your cat or the AAFP, go to www.catvets.com. Thanks for reading! If you have any questions or comments, please contact us. 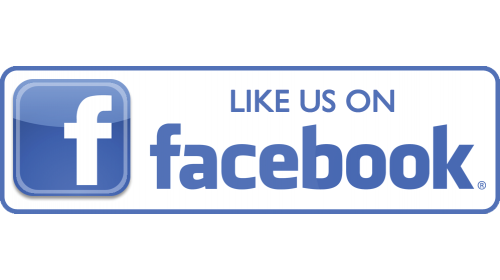 We appreciate your business and look forward to continue to provide quality care and services for you and your pet. We hope to see you in 2015!